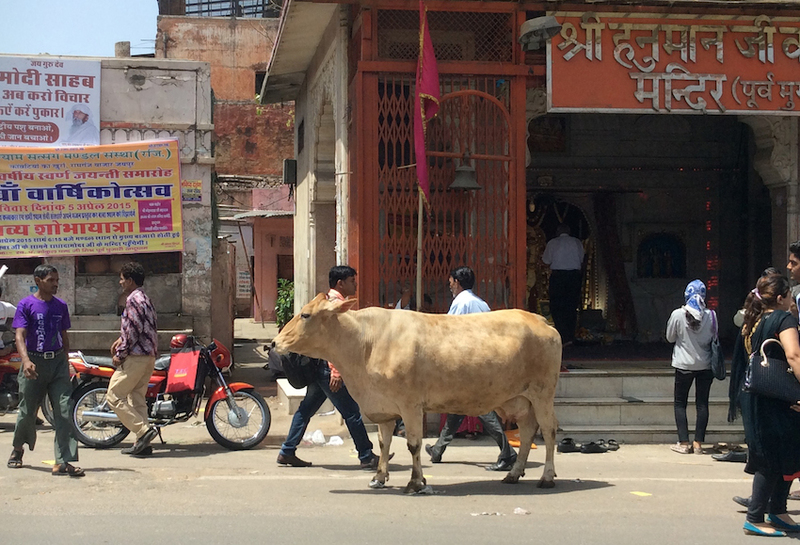 POSTCARD #126: Delhi: Jiab went to Jaipur and sent me this pic of a cow walking past the Hanuman Ji Temple. This lovely cow seems so unconcerned, passers-by too; harmony, things just moving along. All kinds of beings going on their way, dressed in this body given to us – not perfect maybe but this is not a perfect world – and I’m saying that because of waiting here in the hospital drinking bottles and bottles of water before I have the ultrasound scan of the abdomen. Anyway no urine pressure yet, the nurse says with a frown, and tells me to drink more water. So I’m sitting on the hard chair in the corridor watching the strangest people go by. There’s an Imam dressed in white with long grey beard, ancient men in strange costumes I’ve never seen before – could it be Afghanistan? There’s an Arab lady dressed in black, head to toe with a slit for eyes to see the world through. All kinds of amazing beings… and I suppose I must look pretty strange to them too. Then I receive the pic of the cow on my phone… wow! There’s something about India; this enlarged context, the all-inclusiveness. The first thing you notice is how it looks from the outside rather than what’s inside, the context is where the thoughts are situated, the content is what the thoughts are about. In India the diversity is tremendous; language, culture, behavioral protocol. People can’t easily share thoughts, that ordinary intimacy is not there in the way we know it in the West. Anyway, I’m still having this problem, and think maybe if I walk around a bit that’ll help create urine pressure. I have to go to the pharmacy section to pay the bill for some medicine so I’ll do that. Ask how much it is, and it’s 294 Rupees, so I give the man a 500 note and he asks me if I have smaller change – this is always an issue in India – so I have a look and manage to dig out all the small notes I have to give him 300 rupees, I get my 6 rupees change and the man looks pleased, I paid the amount in full and the fact that I have no small change left, is not his concern – how could it be? What to do? Only the 500 note and the rest are thousand notes. I have only a few tens but this is not a good situation to be in, nobody has change for large notes. Go to the canteen and buy a bottle of water for 15 rupees, I give him 20 rupees and he asks me if I have the 5 rupees… here we go again. So I can’t find the 6 rupees anywhere – where is it? Lost deep in my bag somewhere. Okay never mind about the 5 rupees, keep it. Mumbling and unhappy about all these hoarders of small change, go sit in my place and gulp down the bottle of water. Still no urine urge, have to drink more water, go back to the water guy and give him my last 20 rupees, assuming he still hasn’t got 5 rupees change. He gives me the bottle for 10 rupees in lieu of the extra 5 rupees I paid last time! Suddenly my faith in the world is restored, and immediately I have this urgent need to go see the ultrasound nurse. She admits me and there’s that cold slithery thing moving around the lower abdomen. But it’s done, next stop is the toilet and all is well. Self-hatred? At some level – sometimes hazily, rarely consciously or clearly, mostly subliminally – I believe Westerners sense their disconnectedness. Why does Thomas the Tank Engine think all the other trains are more important than him? Because he has lower steam. Just finished the Reiki and sent you especially two emotional and general healing symbols cause a hard time for you. Just adore the photo above. Jiab takes a good picture. India is such a magical place to me. In an anesthesia state I visited India. Told that to the nurse. Must have been there in a previous life. Checking your abdomen– hope all is good. Think Westerners have self hatred because of the lack of spirituality, among other things. Who knows? Interesting though. Thanks Ellen, it happened that I was in the bathroom looking into my eyes in the mirror and, for the first time, reading out a series of affirmations from a spiritual friend here in Delhi who believes I have low self esteem: 1)’I choose to beleve in myself and my capabilities. 2) I easily believe in myself and my capabilities. 3) I have total faith in myself and my capabilities…’ the list goes on. So, all in all, I feel pretty good. Going back to hosp tomorrow to get the results. Thanks for your distance Reiki. You’re very welcome. Hope all comes out okay and you’ll let us all know. Affirmations work so I hear. Amazing, I was visualizing what you experienced as I was reading this experience. Hope your ultrasound scan went well and its nothing serious. Sharing, because I can’t say how much I love Jiab’s picture: distilling my way too short time in India into a single frame. Tiramit himself has been through the wars recently on the health front, so any healing, prayers or thoughts you can spare, would be appreciated, I’m sure. Isn’t it funny how India can look like a circus, yet is somehow more real than anywhere else? It’s almost reassuring to know they still haven’t got the change problem sorted out, though it seems to have grown with inflation. When I was there it was usually an issue of paise. One or two rupees at the most. Mind you, bottled water was in the 5-7 rupee range then. Any idea what a bottled milkshake at Keventer’s costs these days? Arrgh, I’ve just given myself a craving for one of their mango kulfis. The cows can look cute (or incredibly decrepit) but don’t get within headbutt range. You’ll get no sympathy if one knocks into the muck. Folk probably think you must have deserved it. I guess you already use metta meditation for self-esteem problems. Not that I could make it work when I really needed it. Yeh, you brought all kinds of things back to mind. I think of India and the word ‘appearances’ comes to mind – something to do with that, and yet it’s so much more than how something looks; the actuality of it goes into overwhelm. Well, maybe not quite. You’re not so likely to be spontaneously assaulted by authorities for instance. I can certainly see how it puts up walls though. Again, India is a bit different in that respect. Indians have a place for all forms of diversity – even if some of them get het up if it doesn’t stay in its place. I think that’s how the ‘coming home’ feeling so many visitors to India feel arises. There’s already a place there waiting for you – for both good and ill. Some Indians will tell you it’s because everyone has had at least one past life as an Indian. As an English speaking white man you’ll be treated as kshatriya by most, though there’s ways of altering your defacto caste. I was going to say, yes, well, maybe not quite. The abuse of non-whites in the West is exceptional. To an extent I know how they feel, I look at my face in the mirror and wish I was brown, it’s a golden brown such richness in colour. My wife is Thai, she is brown, this golden brown, M is really golden brown, and I’m the colourless one, lacking pigmentation. All the people I know are golden, I have nothing to do with British people, poms, My father went to Australia and he was embittered, later dementia or Alzeimers. All the people I used to know in the old counry are dead and gone. I liked the story of the vendor honoring your previous credit. One moment like that changes everything, causes us to realize the extent of our own false perceptions cast upon the world, so obviously real… so obviously mistaken… We have these reactions to things. They form the boundaries of our experience. Sending you some healing thoughts. I’m encouraged by what you’re saying about how our own perceptions cast upon the world are false, so obviously mistaken… there is such a thing as ‘good’ people the power of love. Sorry Michael, I’m delving into my history at the moment and realize I have this self-hatred. The antidote is ‘forgiveness’ as we’ve spoken about before. My view of ‘guilt’ and I’d say most Scots are the same, is that it springs from the doctrine of original sin – we are born sinners that’s why we are in this world, etc. Of course I abandoned that a long time ago, packed my bags and left Scotland, looking for some other ‘way’. You are right though in saying that it stems from the Western ideal of being “self-made men”, spirit doesn’t play a part in it, all things that are just naturally right in the world are mostly ignored in the West. Faith restored by the water vendor at the clinic and Jiab’s photo of the cow coming at just the right time. Thanks Gary. True, it’s a good-looking cow, things must be not too bad in Jaipur. You’re right about what we were told as children about there being only one Big Daddy in the sky and you better not get him upset. Got to let go of all this nonsense….